Spot welding is used widely in manufacturing, to join sheet metals. The metal work pieces to be welding, are placed between two copper electrodes. Current is passed through the metals via the electrodes, producing a ‘localised’ high temperature, causing the two sheets to fuse / weld together, at the point of contact. One advantage of spot welding is that, although temperatures are high, welding is localised, which means the rest of the material, does not suffer the effects of the high temperatures, such as ‘warping. The current required to produce an effective spot weld, is determined by the thickness of the metals. 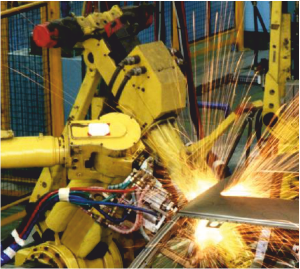 Spot welding is used in the automotive industry, to permanently join car bodywork. It is cost effective due to its speed, accuracy and reliability. It results in an extremely strong, permanent joint, which is very difficult to destroy / take apart. Spot welding is the technique of choice, in the steel sheet fabricating industry.